Bangor Attorney Joseph Baldacci (left) tells the Rev. Daniel Baillargeon and Director of Business Administration Cheryl Whalen of St. John's Catholic Church at 207 York St. about the $395,000 bequest left to the church by communicant and Eucharistic Minister Shann Gillespie. 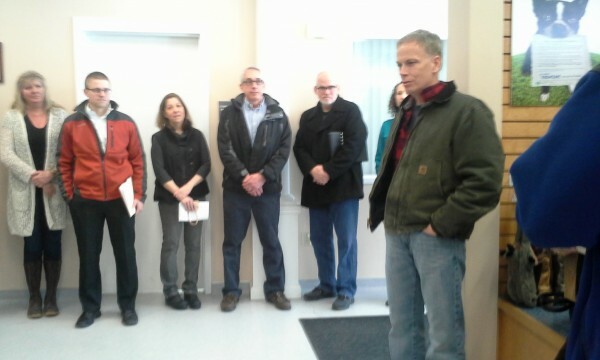 Greg Miller, (far right) former supervisor for Shann Gillespie where she worked at United Technologies Center for more than 20 years, spoke about Gillespie's volunteerism and selflessness during a press conference March 21, 2014, at Bangor Humane Society. BHS received a $395,000 bequest from Gillespie's estate. Some of the members of BHS's Board of Directors are in the background. 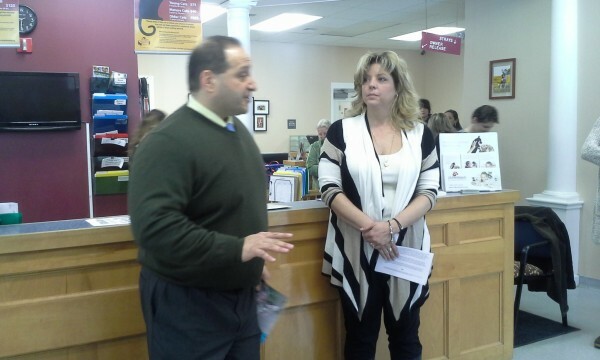 Bangor Attorney Joseph Baldacci explains a $395,000 bequest to Bangor Humane Society Executive Director Suzan Bell at a press conference Friday, March 21, 2014, at BHS. 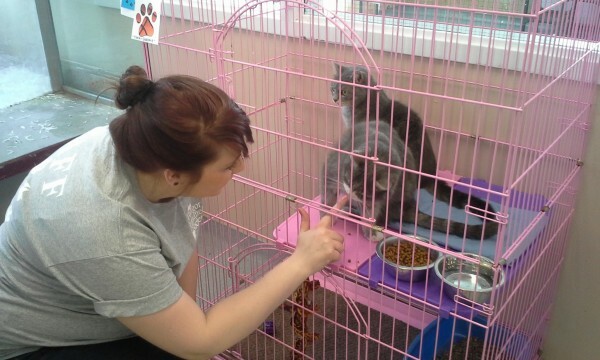 Gillespie had volunteered at the shelter for many years. Adult cats Tink and Queenie are awaiting adoption at Bangor Humane Society. The facility received a bequest of $395,000 on Friday, March 21, 2014, from the estate of Shann Gillespie. BHS plans to use some of the money to expand the cat facility. Kristin Harmon, lead adoption counselor at Bangor Humane Society, takes a moment from her cleaning chores to appreciate adult cats Tink and Queenie, who are available for adoption. The cats and other animals at BHS will benefit from a $395,000 bequest left to the facility by Shann Gillespie. Gillespie's longtime friend and personal representative presented the check Friday, March 21, 2014. BANGOR, Maine — She loved church, animals and people, which she demonstrated in her life with tireless hours of volunteer work on their behalf. Shann M. Gillespie also showed them in death, by sharing her savings with two Bangor institutions where she volunteered. Gillespie had worked as a business manager at United Technologies Center for more than 20 years. She also volunteered in the community, primarily at Bangor Humane Society, as Eucharistic Minister at St. John’s Catholic Church, and at the reception desk at St. Joseph Hospital. She died unexpectedly at age 69 on March 26, 2013. She had no children. Executive Director Suzan Bell said the Bangor Humane Society is raising what it needs for its $925,000 operating budget, and that Gillespie’s gift will be used for something special and meaningful that future generations will see. She said the most likely use would be for capital improvements to the physical plant. 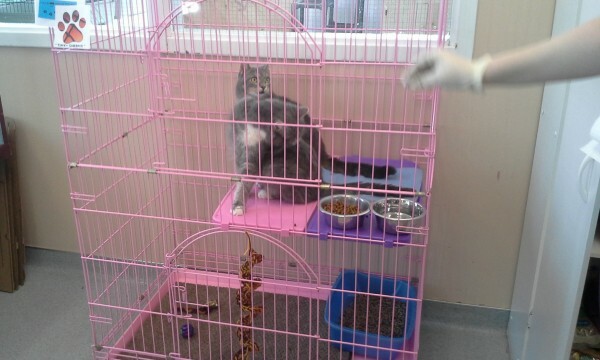 Gillespie loved the cats in particular, so Bell said the improvements could center on the cat portion of the facility. Most of the Humane Society’s Board of Directors membership and several volunteers attended the special presentation, as did Greg Miller, Gillespie’s former supervisor at UTC. “She devoted her life to church, community and animals. She cared. I am happy to be honoring her today,” he said in brief remarks. At St. John’s Catholic Church, Baldacci focused on Gillespie’s faithfulness and humble existence in his brief remarks. “Shann’s life was about service, and in her death, she has continued that service,” he said. 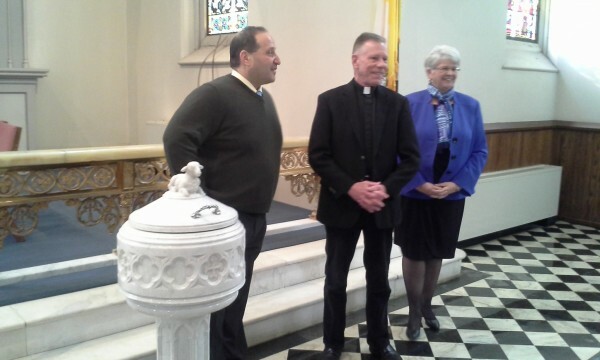 Spellman presented the check for $395,000 to the Rev. Daniel Baillargeon and church Business Administrator Cheryl Whalen, indicating Gillespie wanted it to go into the Parish Improvement Fund. “This is a blessed community indeed from Miss Gillespie’s bequest. We offer prayers for her eternal soul,” said Father Baillargeon, who was reassigned from Old Town to St. John’s in August 2013. Whalen said the most immediate need of the physical church, which was built in 1856, is a new slate roof. Father Baillargeon thought funds could be used toward the roof. He said the interior of the church needs to be painted also, which can cost thousands of dollars. Baillargeon said the church takes in $80,000-$90,000 a month, just to put the contribution in perspective. Although the Bangor Humane Society and St. John’s have vastly different functions in the community, they shared an appreciation for the generosity of one who lived among them and worked beside them, and who, they agreed, would not have wanted the kind of public recognition given to her Friday. “We are blessed indeed,” said Baillargeon.